What are Black Currant Berries? Black currant berries grow on a medium sized woody shrub that is native to Northern Europe and Asia. The berries can be eaten raw but are very strong and tart in flavor so they are most commonly prepared in jams, jellies, and preserves and are often combined with sugar and sweeter fruits for culinary purposes in order to tame the astringency of these berries. But if you can tolerate their tartness, know that there are major healthcare benefits that can be derived from black currant berries and even more so from the oil extracted from black currant seeds. The oil derived from the seeds of black currants is rich in Vitamin E, as well as alpha-linolenic (ALA) and gamma-linolenic acids (GLA), which are healthy unsaturated fatty acids that are useful as a natural healthcare remedy for various purposes. GLA has anti-inflammatory properties that can boost your immune system and lower cholesterol levels as well as blood pressure. Black currants also have a high concentration of antioxidants, Vitamins A, B-1, B-5, B-6, and C. In fact, black currants contain 4 times the amount of Vitamin C as oranges. The antioxidants present in black currant seed oil protect your cellular composition from damage induced by free radicals, giving the oil anti-aging effects on your skin. The Vitamin C present in the oil boosts collagen production which keeps your skin elastic and supple as you age. The Vitamin E provided by the oil slows down any damage to the skin caused by the sun’s harmful UV rays. The anti-inflammatory properties (see number 2 below) are also beneficial for the treatment of inflammatory skin conditions such as eczema and acne. The anti-inflammatory properties of black currant seed oil are helpful for improving your immune system as well as fighting against the inflammation that causes osteoarthritis and rheumatoid arthritis, making this oil very beneficial in minimizing health issues that are due primarily to aging. Black currant oil also serves to protect the heart and blood vessels and can result in lowering blood pressure as well as cholesterol levels for better heart health. Regular use of black currant seed oil has been shown to lower a person’s susceptibility to allergens. Black currant oil supplements, which contain omega-3 and omega-6 fatty acids, have been shown to increase hair density by inhibiting testosterone from converting to dihydrotestosterone (DHT), the hormone that is responsible for androgenetic alopecia (male or female pattern baldness). One of the most common and notorious symptoms of menopause that plagues women at this stage of life is hot flashes. 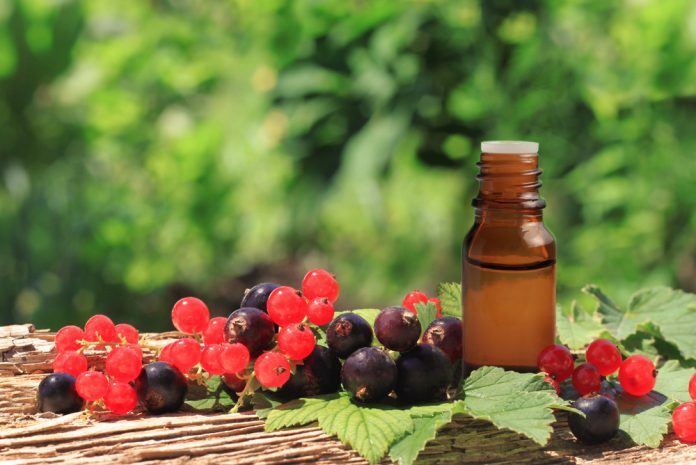 While primrose oil is a popular treatment for coping with menopausal hot flashes, it is currently under investigation to see if black currant oil has the same beneficial effects. It is thought that the anti-inflammatory properties of the GLA contained in black currant oil can possibly suppress nighttime hot flashes in menopausal women. Many women in various stages of menopause experience a variety of difficulties with sleep. Some have problems falling asleep while others have issues with remaining asleep through the night. The essential fatty acids contained in black currant seed oil can produce a natural sedative effect and promote more restful sleep during menopause. Another common symptom that occurs during menopause for many women is breast tenderness, similar to the tenderness that occurs during PMS. The anti-inflammatory properties of the abundant GLA in black currant oil will help to reduce the pain caused by tender breast tissue. As women enter the stage of Perimenopause and draw nearer to the end of their reproductive years, periods can become erratic and quite painful. The anti-inflammatory effects of black currant oil can also minimize this pain. If you are considering adding black currant oil to your health care regimen, there are some precautions to keep in mind. Also, remember that it is important to consult with your physician before adding even natural supplements to your diet especially if you already take prescription medications for various health issues. Common side effects of black currant oil can include upset stomach, constipation, diarrhea, or headaches. Allergic reactions can occur such as rash, itchy skin, breathing difficulty, swelling of the lips or tongue, and chest pains. Side effects are more likely to occur with excessive use of black currant oil. Therefore, it is very important to discuss use with your doctor to be sure that your doses are safe and healthy. The following people should not use black currant oil supplements: pregnant women or people with epilepsy, prostate cancer, or bleeding disorders. Black currant oil is not for purposes of aromatherapy.